Hello Loves! I have lots to show you this week. It was a week full of fun and nail art. :) I'm not even sure where to start! How about a few technique status updates followed by a little nail art? Ok, so my instructor's motto is "10,000 reps". What exactly does that mean? She says that it takes 10,000 repetitions to master a technique. So when we aren't working on clients, we spend our time doing rep after rep of the basic techniques on our mannequin hands - silk wraps, blended tip with overlay, and acrylic sculpts. Here's my blended tip with overlay from this week. I confess, this is the most difficult for me. You might think a tip with acrylic over it would be easier than sculpting on a form, but not for me. I struggle with how thick to make the overlay. Of course, I polished it since need to practice polishing hands that aren't my own. It's amazing how much the angle of the hand makes a difference in polishing technique. Now for the fun part of the week. I made honor roll for January! Whoo Hoo. I would have made it for the other months but they count attendance and being out with sick kids knocked me out. This past month I was able to make up enough hours to barely squeak by. Part of honor roll is a free service from one of the departments. There's a list that I can choose from, and I haven't decided what I want yet. Maybe the hand and foot treatment from Esthetics. A nice hand and foot massage sounds great! But I digress. One of the students from Esthetics came over for a gel polish manicure. She has the most perfect nails I have ever had the pleasure of polishing. So perfect that I just had to do some nail art on them. Of course, she was happy to let me. Her nail beds are so long and beautiful. I know you can't see them since I forgot to get a before picture, so you'll just have to trust me. If I ever need a hand model, I'm going to beg her to play the part! The colors I used are OPI Gelcolor Strawberry Margarita, IBD Just Gel Polish Gel Art Polish in Just Red, and Akzentz Gel Play White. I didn't buy any due to a lack of funds, but I did have a blast cruising through the colors. Rest assured, though, as soon as I'm back on my feet financially, I know where I'm going! They had several other brands I adore too. IBD, Cuccio, LeChat, and many many more. I almost snapped pictures of those too, but I didn't want the girl behind the counter to think I was nuts. This display reminded me that I have two Kiara Sky colors in my stash that I haven't shown you. Since they're pink, I decided to use them in a Valentine's Day themed mani. Want to see it? Oh yeah, in case you missed it in the KBShimmer Spring 2015 Collection review, I removed my gel extensions. I got tired of having to file the color off and knew I had a major swatch session coming this past weekend. So my nails are quite short right now. I do have a gel overlay on the two that I overbuffed when I first started school. Yes, I wrecked my own nails. Oh the irony! That's also why my middle and thumb nails have a strange shape - they were so short that I couldn't file them to my usual squoval. Oh well, they'll grow back. :) Here's another pic of the Kiara Sky Valentine's Day design. The main color is Pink Lipstick and the accent nail is Geisha. The middle finger is stamped with Pure Ice Silver Star and Bundle Monster H18 from the Holiday Collection. I went ahead and swatched the colors for you too. Pink Lipstick is a medium pink with a gorgeous silver shimmer. It is opaque in two coats and applied beautifully. I'm finding this to be a trend with Kiara Sky colors (glitters aside). This is why I plan to add more to my collection! Plus the built in base saves time. Geisha is a clear base that is loaded with pink and silver glitter. I swatched two coats here and it is almost opaque. A third would have provided better coverage, but it would also add bulk so I stopped at two. The accent nail in my mani above is also two coats. I took this shot a little blurry in an attempt to capture the holographic effect a little better. I'm not sure I succeeded, but here it is anyway. That pretty much wraps up this week. Today is an exciting day so I'm sure I'll have more to share next week. Today is my first Mock State Board. I'm not participating this time, but I have to be there to observe. So I get to see first hand what it will be like when I take the State Board Practical exam in a few months! Oh, and we have another nail art competition tomorrow. That should be fun too. 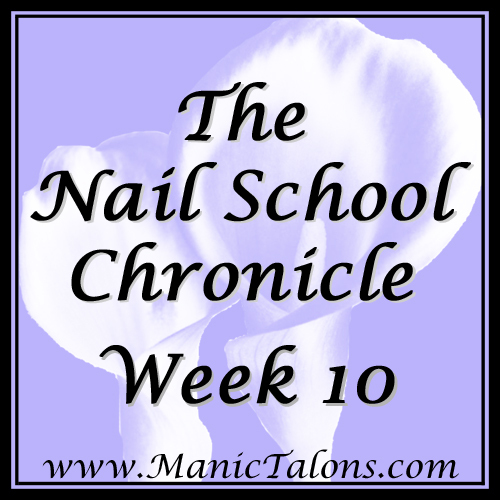 Speaking of a few months, here's the Manic Talons Manicurist Dream Drive update. Like that name? I can't take credit for it, but it does roll off the tongue quite nicely. As of 10:00 pm Sunday night, you have helped me reach 20.5% of my goal! I'm still absolutely blown away by your support. Of course, I still have a ways to go, but I'm confident I'll get there. Speaking of which, I'm still working on that destash. 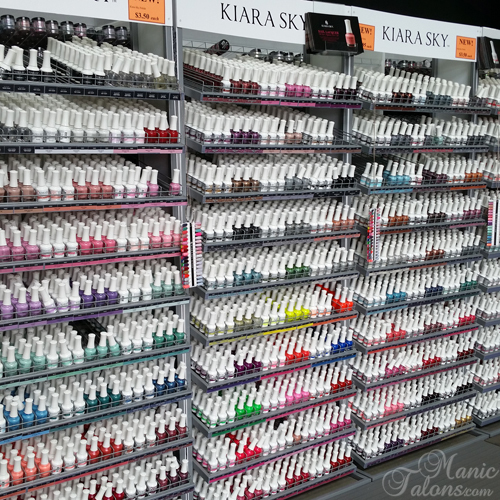 Not going to lie...it breaks my heart to list some of these gel polishes. I'm a true gel polish hoarder. But I also know that it has to be done if I want to reach my dreams. It's just going slow with so many to list. I might have to start rolling it out in stages if I can't get them all listed over the next week. One other thing...does anyone have knowledge of running a raffle online? If so, will you kindly email me? I could use some advice. My email address is on the Disclosure page. Yay glad things are going well! How do you like the Kiarasky?? I also heard TransDesign is in atlanta?? Have you been there?? I mean the Kiarasky on the whole as a brand and how there gel compares? ?